Diamantina Shire, an area of 94,832 sq km, is in the extreme west of Queensland, with Poeppel Corner (the intersection of the Northern Territory, South Australia and Queensland borders) as its south-westerly point. It was named after the Diamantina River encountered by Burke and Wills in 1860 and thought to be a continuation of Eyre Creek. It was left unnamed until John McKinlay crossed it in 1862 and named it the Mueller. 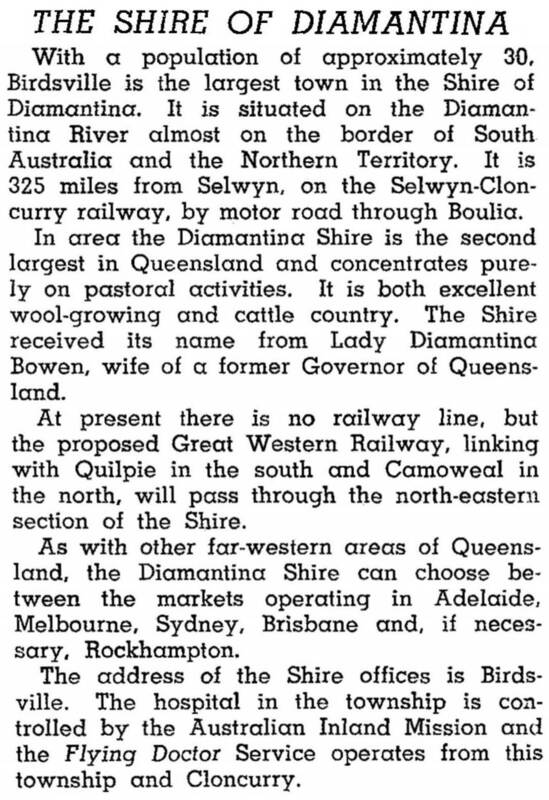 Four years later William Landsborough renamed it the Diamantina, after Lady Diamantina Roma, wife of Queensland's first Governor, Sir George Bowen. Rising north-west of Winton, the Diamantina forms a maze of seasonal channels running southward in the vicinity of Birdsville. Its floodwaters can reach the Goyder Lagoon, 140 km south-east of Poeppel Corner and outflow into the Warburton River. Birdsville is the shire's best-known town, and at one time was its administrative centre. Located just inside the southern border, Birdsville gave way to the more centrally located Bedourie to where the shire offices were moved. Birdsville's origins arose with the celebrated Birdsville Track. In the 1870s Queensland cattle drovers took livestock to southern markets at Wodonga and Melbourne along the Strzelecki Track, a route pioneered by the cattle stealer, Harry Redford. The Strzelecki skirted the eastern edge of Sturt Stony Desert and passed through Innaminka. The dry stages were too long, and an inland alternative, west of the desert, was tried. The alternative kept near the Diamantina watercourse which crossed where Birdsville was settled, and the Track went on to Maree on the Port Adelaide to Oodnadatta railway (the railway terminated at Quorn (1882) and was extended to Oodnadatta in 1891). 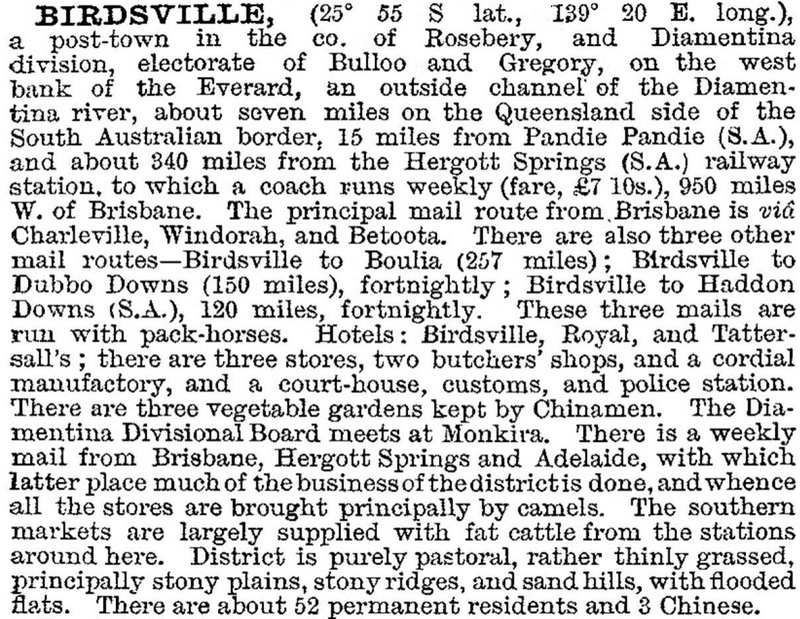 The alternative stock route and the Adelaide market were clearly preferred, and Birdsville had both a store and a hotel by 1882. The present hotel is a replica of the one dating from 1885. In 1886 the Diamantina local government division was established. Considered by many to be Queensland's most remote town, Birdsville attracted the attention of John Flynn in 1919 as a site for the AIM medical service. The AIM nurses arrived in 1923, at a time when supplies came by camel twice a year from Maree. The year was drier than usual, but a dinghy was kept tied to a tree in readiness for the next flood. The most documented part of the shire is the short bit of the Birdsville track down to the South Australian border. In the 1950s George Farwell wrote Land of Mirage and the Shell film documentary Back of Beyond made the mailman, Tom Kruse, a famous personality. Birdsville's popular fame probably accounts for it having four sites on the Queensland heritage register: the first AIM hospital, formerly the Royal Hotel (1883); the second AIM hospital (1953-2005); the Birdsville Hotel (c1884); and the Court House (c1890). Diamantina Shire's dominant industry is cattle grazing. In 1992 there were 86,000 head recorded. There is a hotel, caravan park, hospital, information centre, primary school (1899) and racing club in Birdsville. Bedourie has a general store, hotel, the shire office and a community centre. At the 2011 census Aboriginal and Torres Strait Islander people made up 25% of the population.